After the last firecracker has been burst and the last lamp has flickered to darkness, a familiar post-Diwali ennui settles over us all. Call it the Black Hole after the Big Bang, but as we look at the prospect of packing up the fairy lights, disposing of the boxes of mithai—not to mention returning to work—we want to curl into our bed-clothes and not emerge till Christmas. Located 9km south of Kovalam, Kerala, this is supposed to be the world’s first Ayurvedic beach resort. It’s not a claim you want to argue with, especially when you have the vivid blue expanse of the Arabian Sea on the one hand and the painstakingly replicated Kerala houses in a lush backdrop on the other. Chithra, manager, operations, Somatheeram Ayurveda Resort, recommends a 14-day Manasanthy package that addresses the stresses on the body, mind and soul. The package includes a daily 2-hour Ayurvedic treatment (prescribed by a resident doctor after a consultation), and a 90-minute yoga and meditation session, besides Ayurvedic meals, medicines and a personalized diet plan. Packages start from Rs2.6 lakh for standard double rooms. 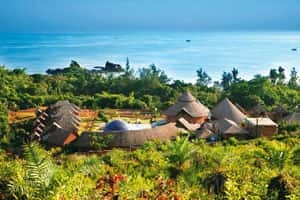 On a beach shaped like the Sanskrit letter for “Om", this CGH Earth resort in Gokarna, Karnataka, caters to both those in search of salvation and lesser mortals looking simply for me-time and massages. Dayananda and Sobha, both Ayurveda practitioners, assess individuals on the basis of their doshas (constitutions), and accordingly prescribe treatments. Panchakarma, a rigorous programme lasting three-seven days, is recommended for eliminating toxins built up over a period, but there are more accessible therapies available as well. Try laughter yoga, during which false smirks very quickly change into real giggles and full-throated guffaws, thereby deepening the breath, toning the stomach and, best of all, lifting the spirits. Resident teachers also conduct classes in pranayam, asanas and meditation. A week-long Lifestyle package for two, open only to Indian nationals, costs Rs1,07,520, inclusive of taxes, transfers from Goa airport, all meals and yoga sessions, but exclusive of Ayurvedic therapy (a six-day package can be added on for Rs18,500 per person, which buys one treatment per day). Mind mending: Visitors to SwaSwara practise asanas in the open. A seven-day Panchakarma package starts from Rs1,01,500 for two, while the anti-ageing package costs upwards of Rs93,065 for the same period; both are inclusive of accommodation, all-vegetarian meals, treatments, medicines, airport transfers, etc. The name comes from the Sanskrit word soukhyam, or well-being, proving yet again that ancient Indians knew far more about living a good life than we give them credit for. Unlike other establishments that choose to specialize in Ayurveda, Soukya integrates the art of healing with naturopathy, homoeopathy and 30 other complementary therapies, including yoga, acupuncture and reflexology. To tackle the post-Diwali bloat, Soukya’s senior physician, Dr Shubha, suggests a detox programme that fights weight gain, strengthens the metabolism and improves digestion. Shudha, the 10-day programme, includes Ayurvedic cleansing treatments, detoxifying mud packs for the face, eye and abdomen, a herbal colon irrigation, three nasya treatments, seven shirodhara therapies and an acupressure session. A seven-day de-stress programme, Sukha, incorporates an Ayurvedic hot-stone massage, hip baths, aroma and foot baths. Besides, of course, there are yoga classes twice a day, and access to the swimming pool, library and walking track. Between October and March, a 10-day Shudha and a seven-day Sukha package for two cost around Rs3.65 lakh and Rs2.7 lakh, respectively, inclusive of airport transfers, medicines, laundry, et al. At the Leo Juventa Centre for Integrated Medicine in Hyderabad, part of the Sterling Hotels group, resident doctor Nina Pradhan recommends a five-day detoxification package called Pristine Persona. “It’s like an annual clean-up of the body," Dr Pradhan says. “Toxins build up over a period of time, most commonly sourced from smoking, air pollution—an especially potent cause over the Diwali period—unhealthy food, etc. This package uses the best of naturopathy, Ayurveda and modern medicine to purge out the toxins." The treatment includes a consultation with the doctor and a diet prescription, a hydrocolon, personalized Ayurveda and natural therapies, ocean aroma therapies, an antibacterial rejuvenating oxygen facial, teeth polishing, yoga and meditation. Their recommended five-day package for one costs Rs15,000, but a shorter three-day package is also available for Rs9,000. Accommodation packages start from Rs7,500 a night for two. Located on Divar island on the Mandovi river in Goa, the Devaaya Ayurveda and Nature Cure Centre requires the Diwali-distressed to stay a minimum of three nights for a naturopathy programme. “The morning will begin with cleansing kriyas and yoga. Later in the day, there will be a massage, a mud bath and specific treatments for local problems, if any," says Dr Manoj, the resort’s resident doctor. Apart from sourcing its treatments through natural elements—primarily water and earth—the treatment also calls for a diet of fruits, vegetables and cereals. Gentler than a detox programme, it is tailored for the time-crunched professional looking for quick, effective solutions. As with all de-stress programmes, however, much depends on how much one carries over into one’s regular life: Yoga and meditation are recommended takeaways. Packages start from Rs4,500 per day, inclusive of accommodation, naturopathy therapies and prescribed diet for two.